360° Tour of @MIT’s Alcator C-Mod Tokamak (Test Fusion Reactor), and a Recent Fusion Record « Adafruit Industries – Makers, hackers, artists, designers and engineers! 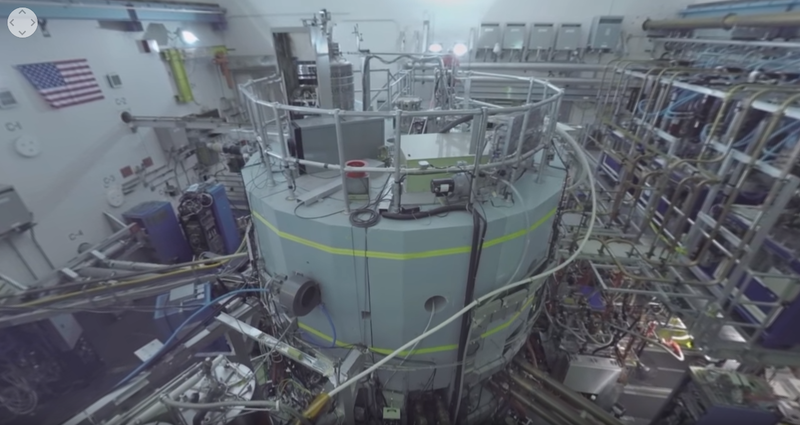 Great video (below) of MIT’s Alcator C-Mod tokamak, outside and inside the unit, as well as the laboratory that monitors the results of the chamber when tests are conducted – all in 360°s! And the team overseeing this reactor recently eclipsed ‘2 atmospheres of pressure for the first time‘ on their way to the “triple product” required to make fusion a viable reality. On Friday, Sept. 30, at 9:25 p.m. EDT, scientists and engineers at MIT’s Plasma Science and Fusion Center made a leap forward in the pursuit of clean energy. The team set a new world record for plasma pressure in the Institute’s Alcator C-Mod tokamak nuclear fusion reactor. Plasma pressure is the key ingredient to producing energy from nuclear fusion, and MIT’s new result achieves over 2 atmospheres of pressure for the first time. Alcator leader and senior research scientist Earl Marmar will present the results at the International Atomic Energy Agency Fusion Energy Conference, in Kyoto, Japan, on Oct. 17. Nuclear fusion has the potential to produce nearly unlimited supplies of clean, safe, carbon-free energy. Fusion is the same process that powers the sun, and it can be realized in reactors that simulate the conditions of ultrahot miniature “stars” of plasma — superheated gas — that are contained within a magnetic field.